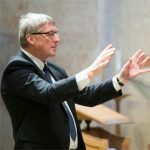 David Temple MBE has been Musical Director for Crouch End Festival Chorus since 1984 and for Hertfordshire Chorus since 2000. But his musical life started long before that. David was a teacher at Goldbeaters Primary School and had identified a need for investment in musical instruments. He decided to put on a concert to raise money towards this cause. He chose the date, booked a slot at St Alphage’s Church in Burnt Oak and set about finding performers. The concert was for choir and organ. David decided to include the school’s Recorder Consort, who were called upon to play some Byrd and Bach. As concert day approached David started to experience his first case of ‘Conductor’s Anxiety’. The organ in the church was a little rickety and it was only when the 50 strong choir burst in with Handel’s Zadok the Priest that the audience knew this might be worth listening to. The programme included Vivaldi’s Gloria as the main work and a performance of Mozart’s Ave Verum Corpus. The children performed brilliantly and David was very proud. ‘Those children will now be around 50 years old and I do wonder how their lives panned out and if they remember the event. David recently realised that the anniversary of his first foray into the world of conducting coincides with an upcoming concert. Crouch End Festival Chorus, the choir that David helped to found in 1984, will perform Stravinsky Les Noces and Orff’s Carmina Burana at the Queen Elizabeth Hall at 3pm on July 1st 2018. The Chorus will be joined by primary school children which seems fitting.